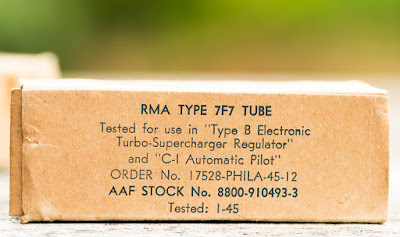 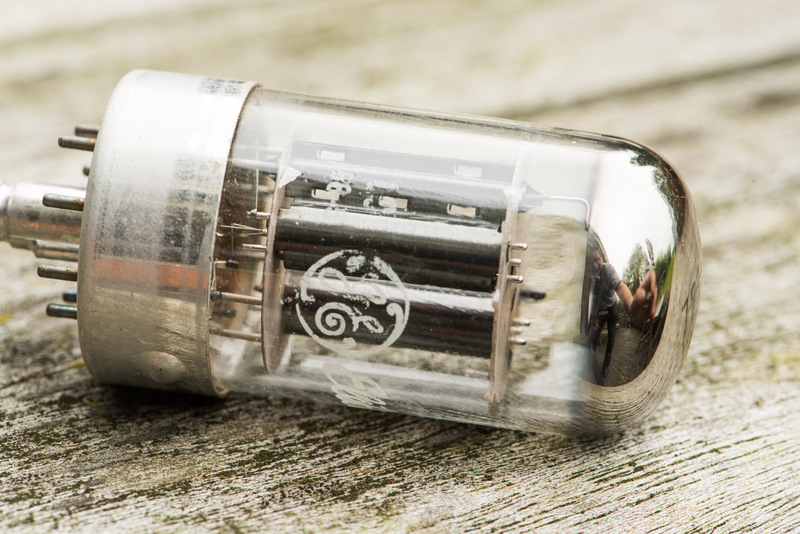 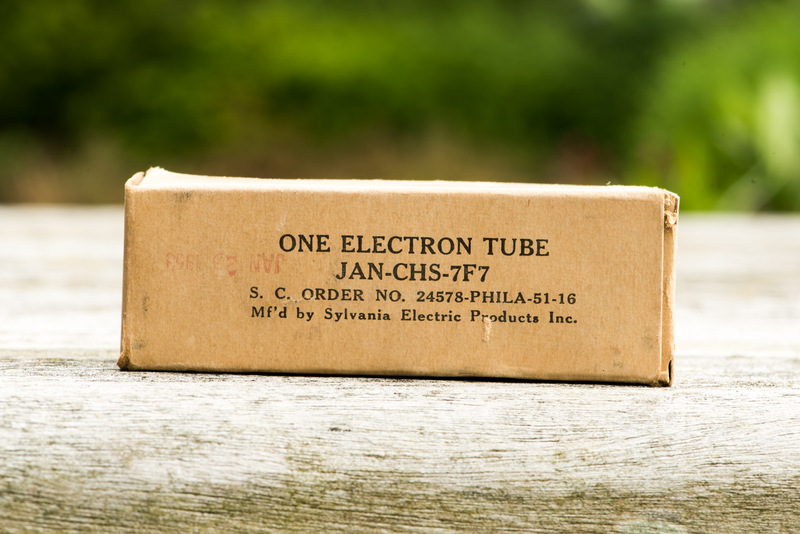 This months tube is an electrically equivalent tube to the 6SL7 which was presented last month. 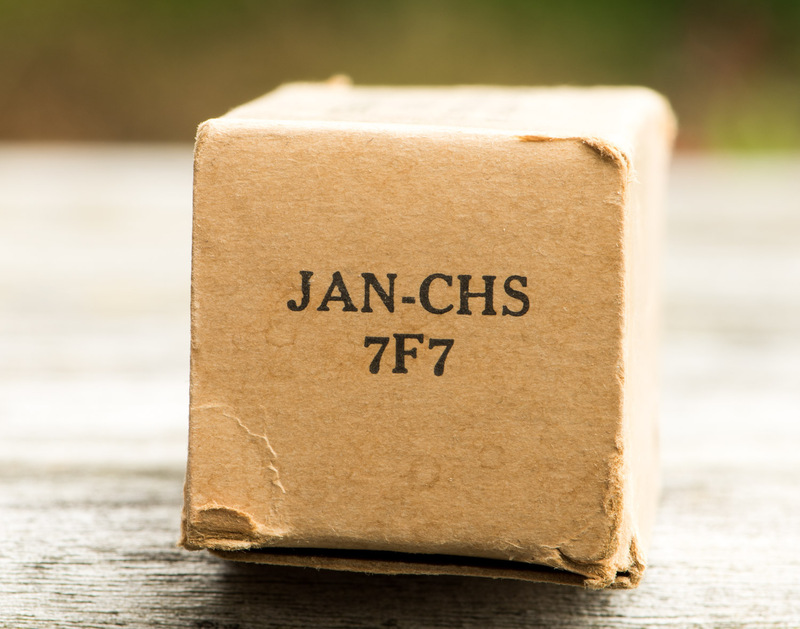 The Loktal type 7F7. 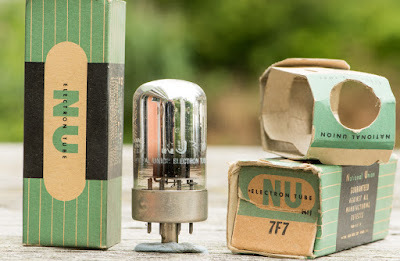 Like the 6SN7 which has a Loktal pendant in the 7N7, the 6SL7 also has a Loktal equivalent. 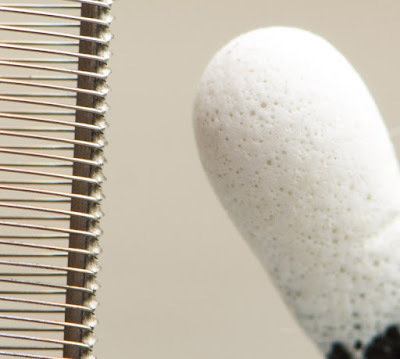 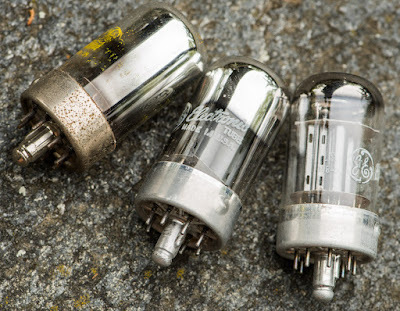 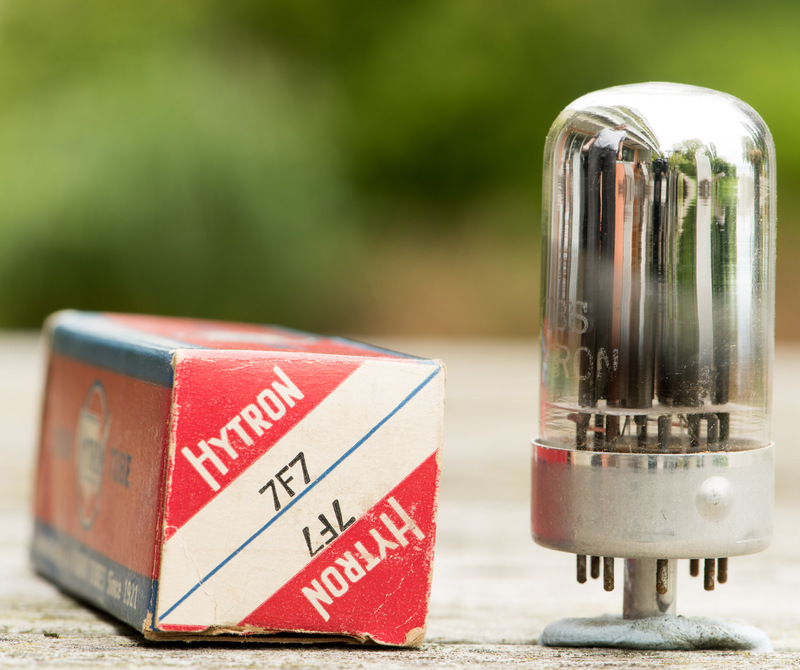 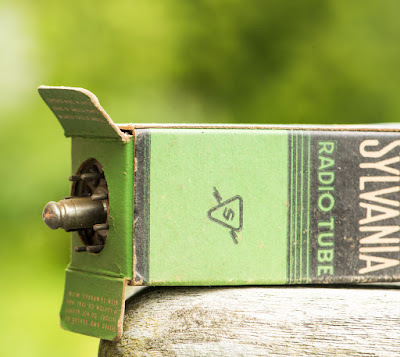 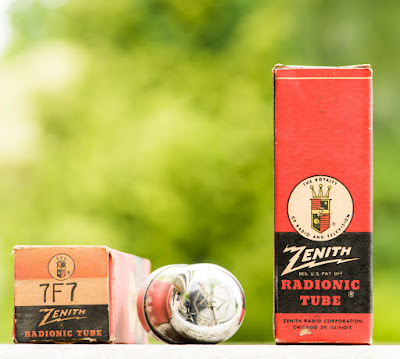 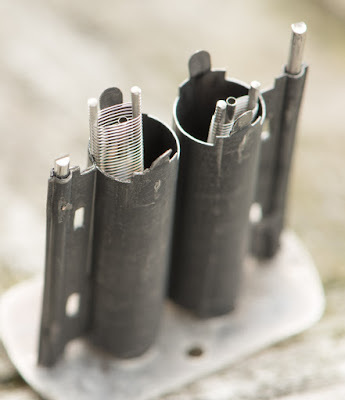 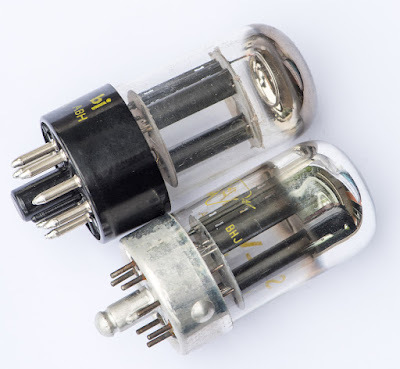 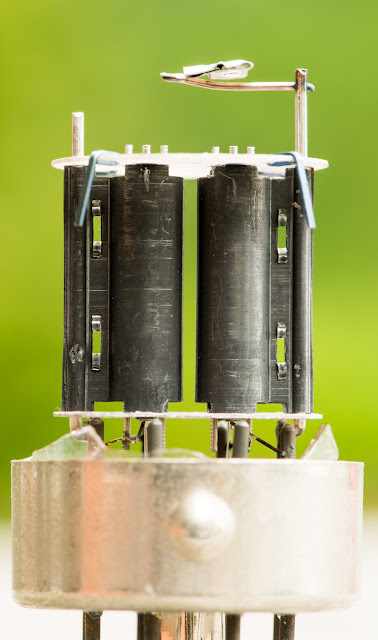 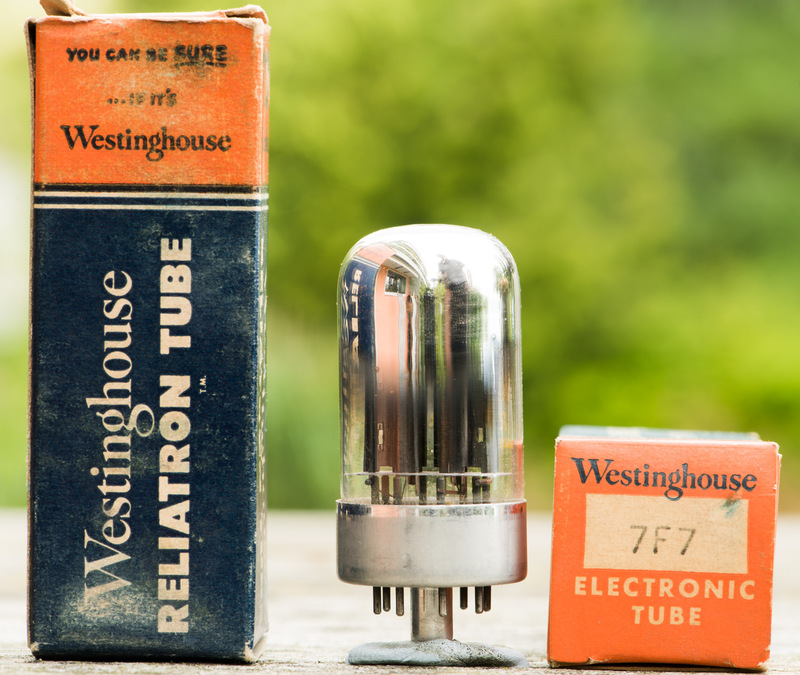 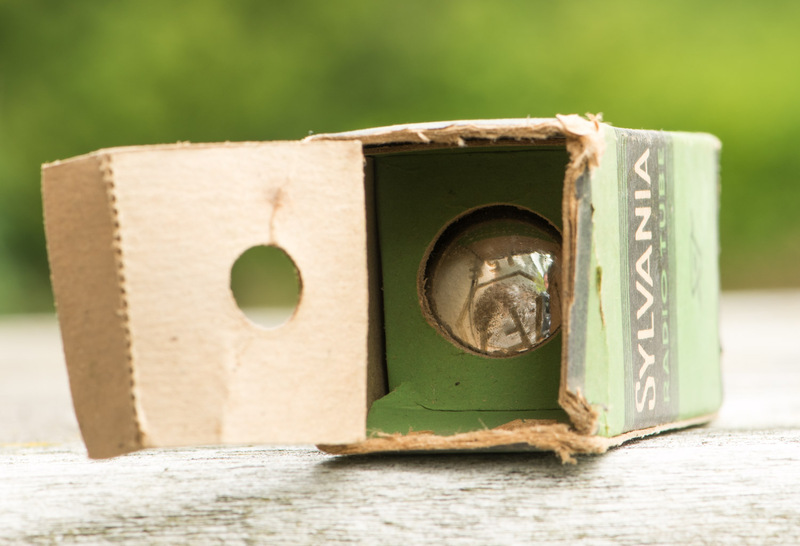 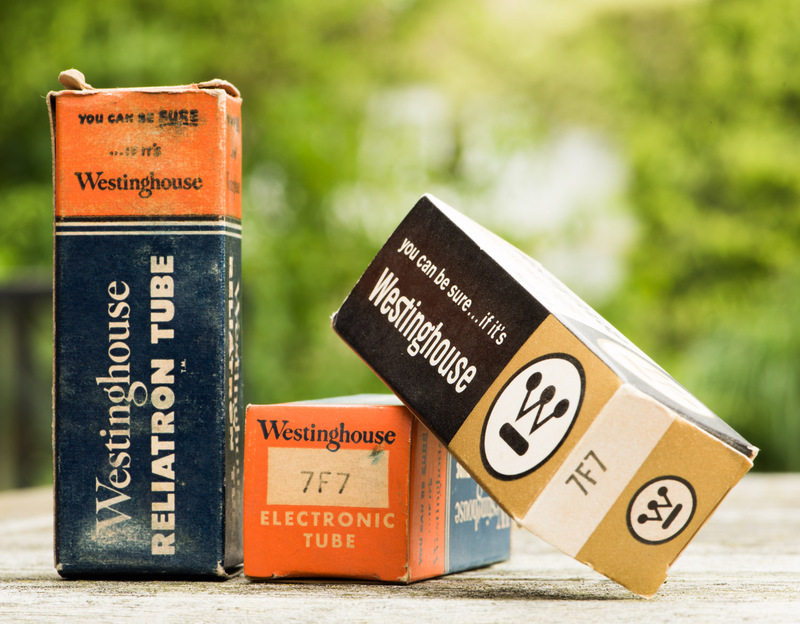 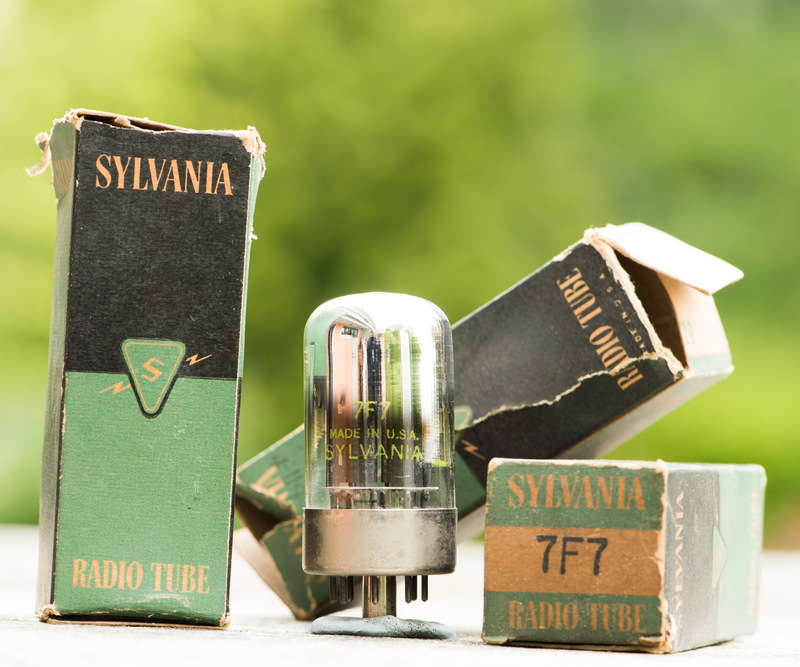 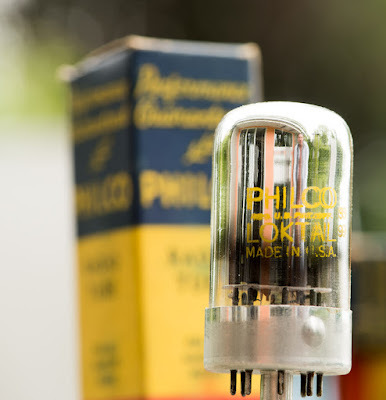 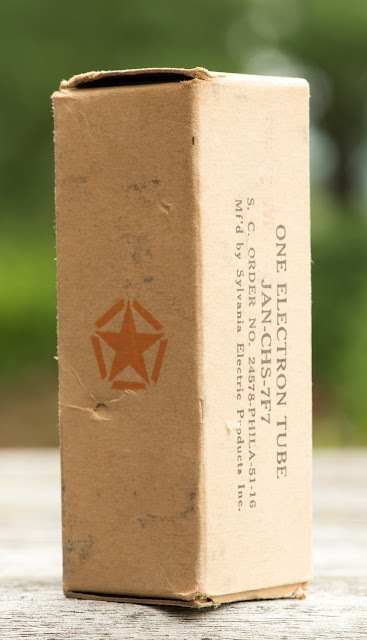 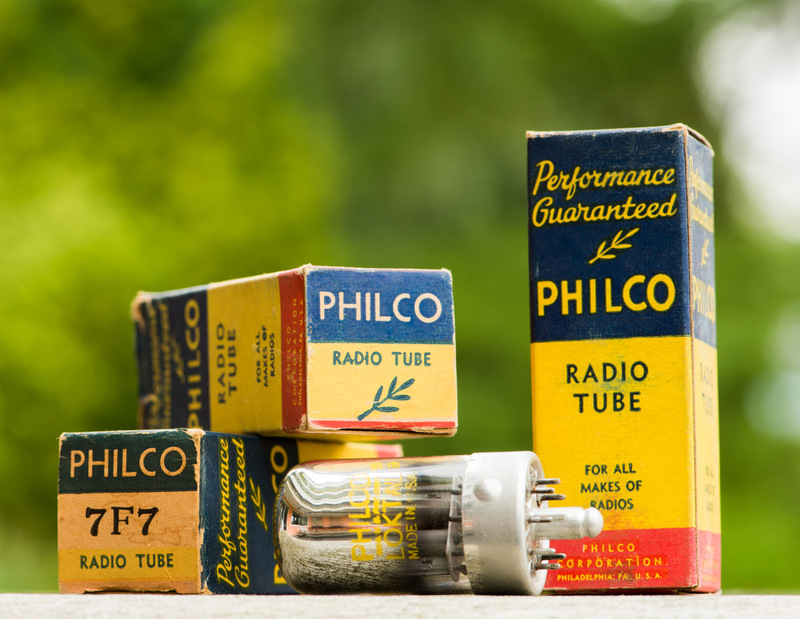 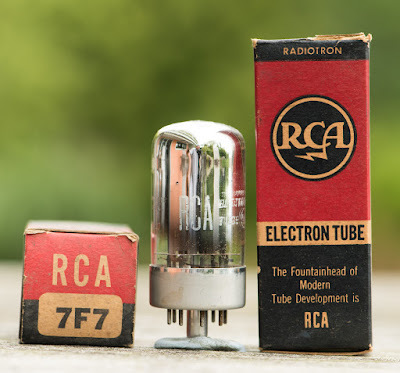 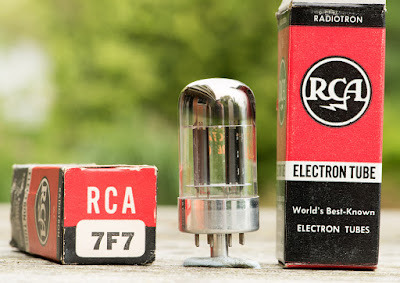 When Sylvania introduced the Loktal base, they made equivalents to the most popular Octal tubes. 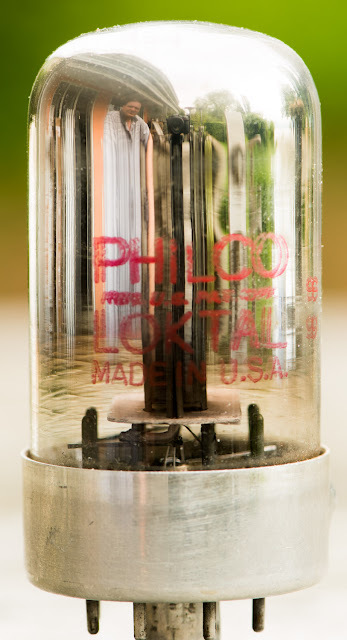 So a Loktal replacement for the 6SL7 was a logical choice to make. 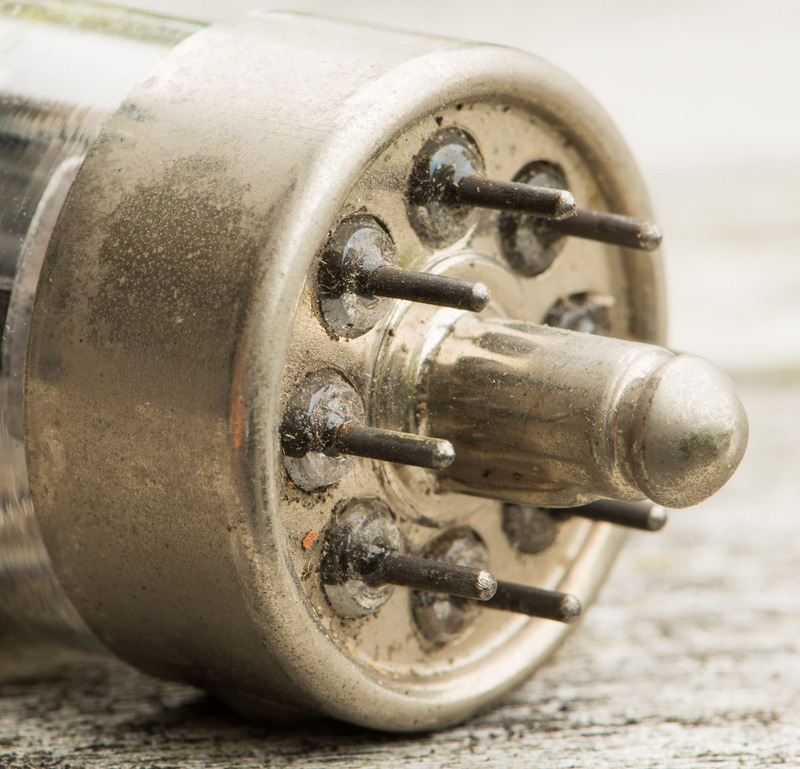 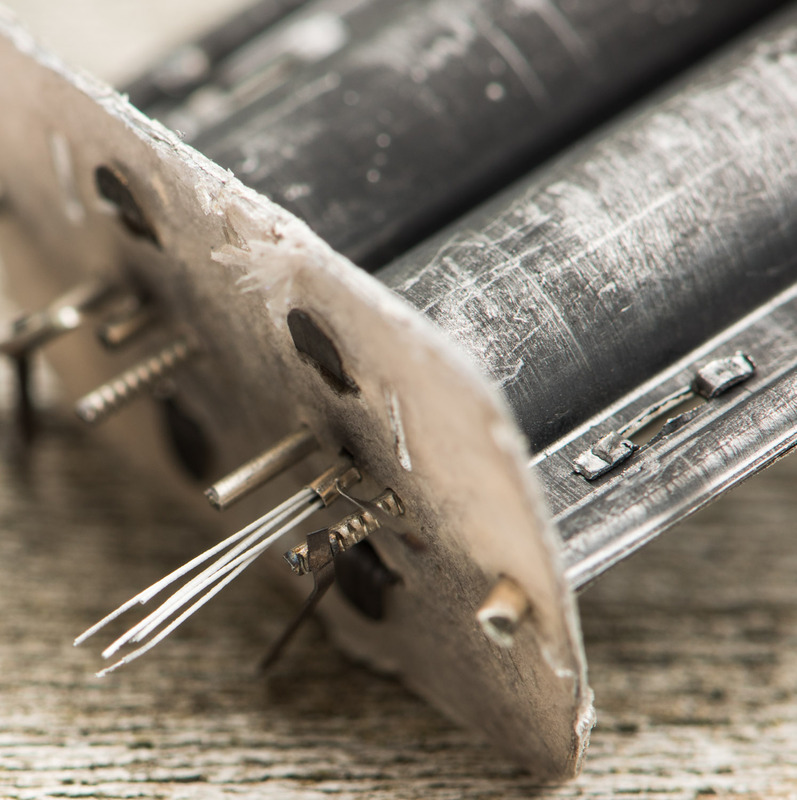 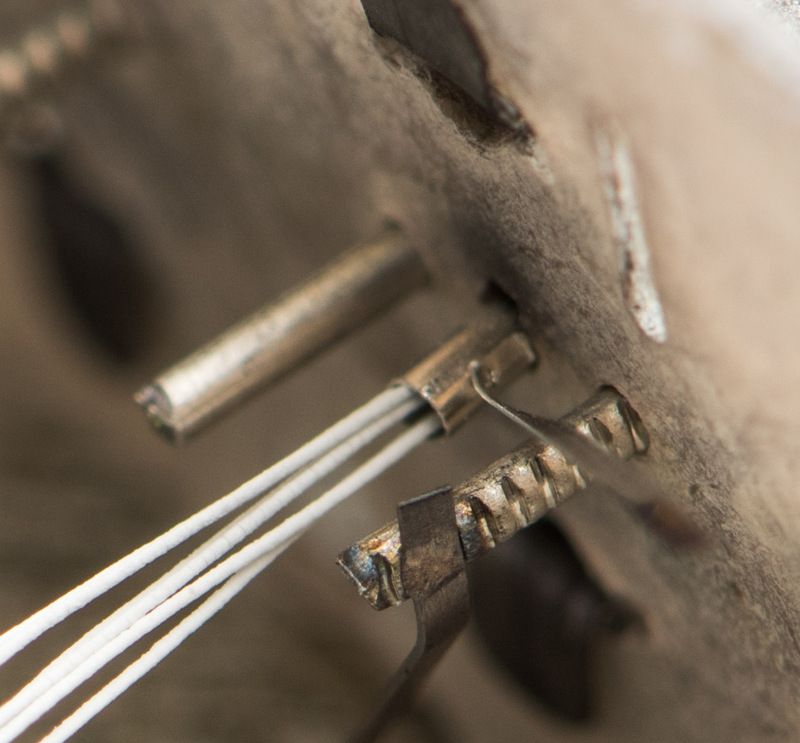 The 7F7 has the same symmetrical arrangement of the pins as the 7N7. 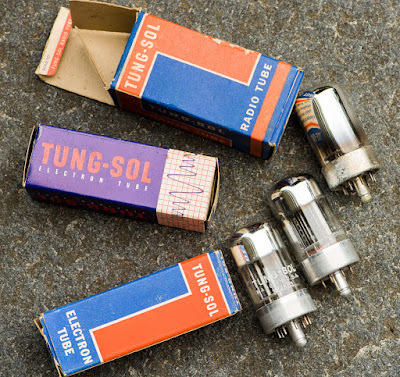 See pinout on the left. All electrical parameters are the same as for the 6SL7. 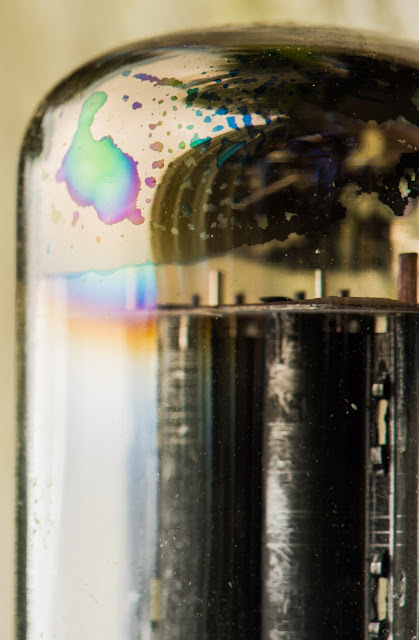 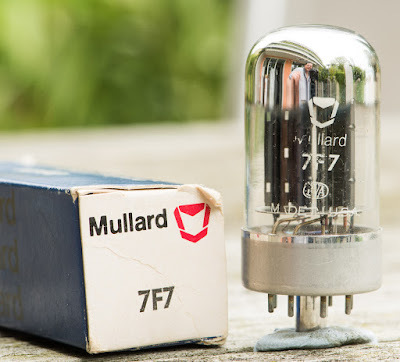 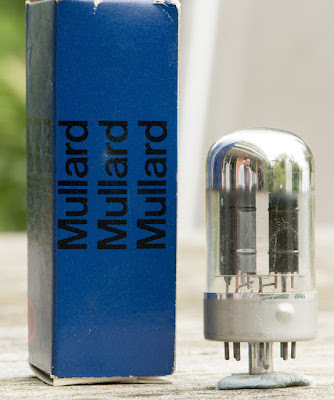 An amplification factor of 70 which classifies it as high mu double triode. 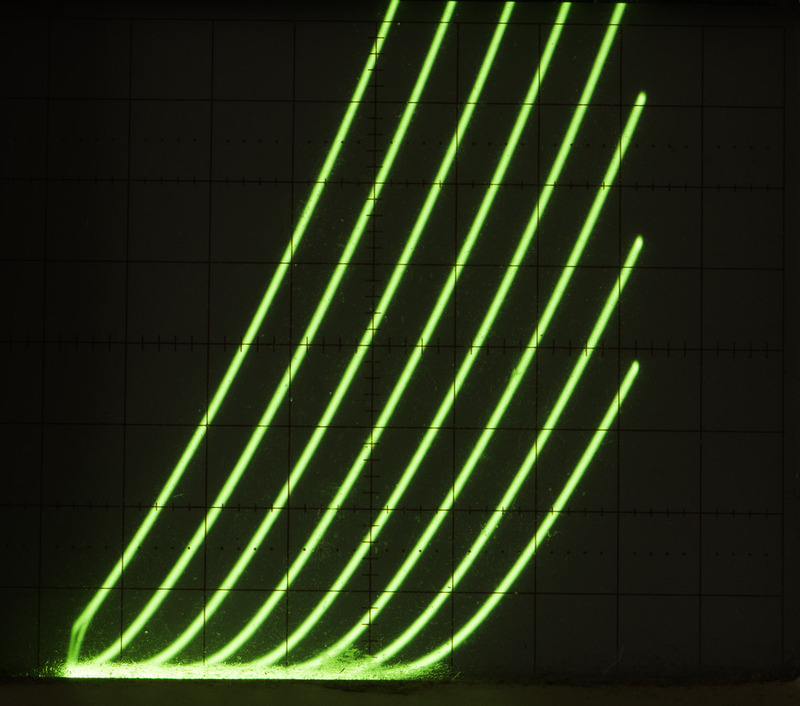 A plate resistance of 44kOhm at an operating point of 250V/2.3ma. See the data sheet for all technical parameters. 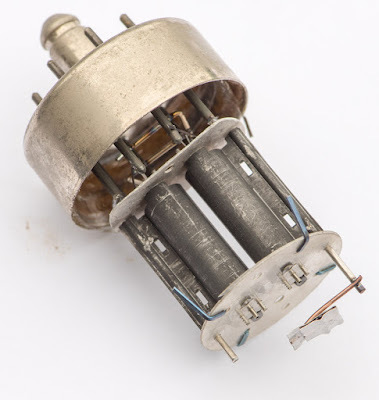 The heater voltage listed in the earlier data sheets is 7V which seems not equivalent to the 6SL7. 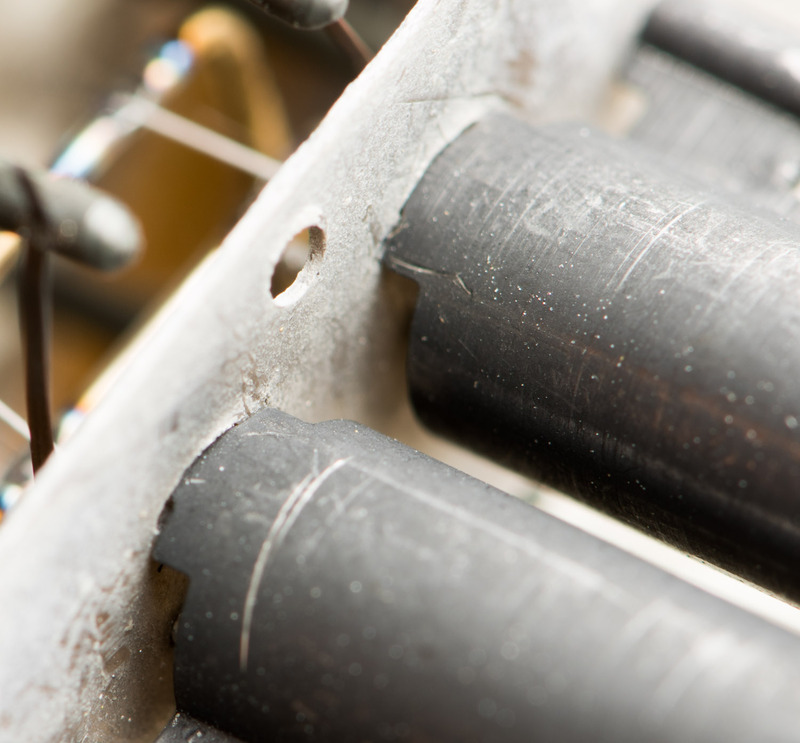 Also the heater current at 0.32A is slightly higher. 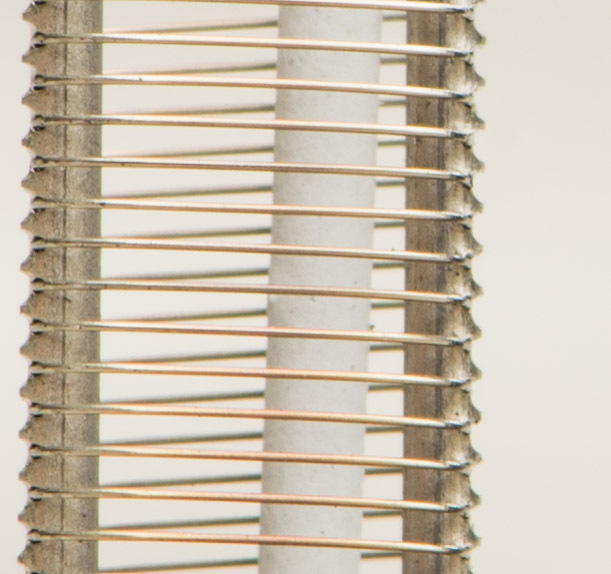 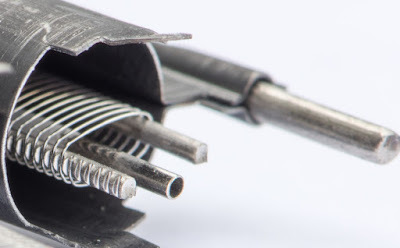 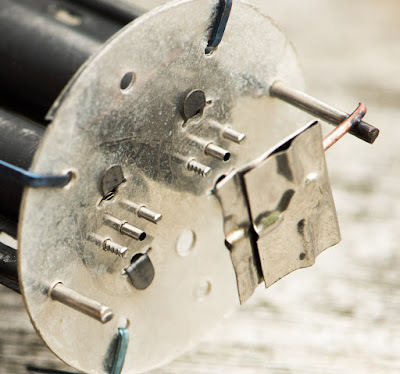 In later data sheets the heater voltages of Loktal tubes was specified at 6.3V. 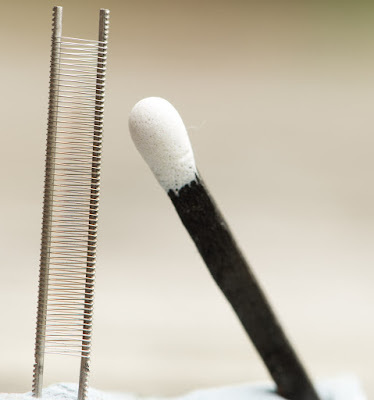 This may seem confusing but there is a simple explanation. 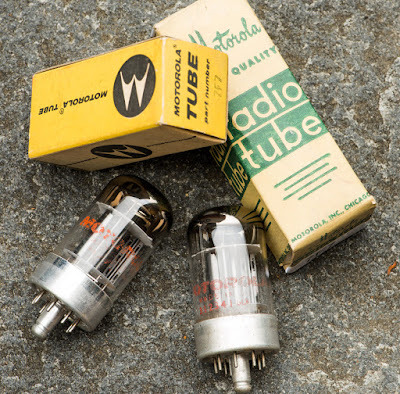 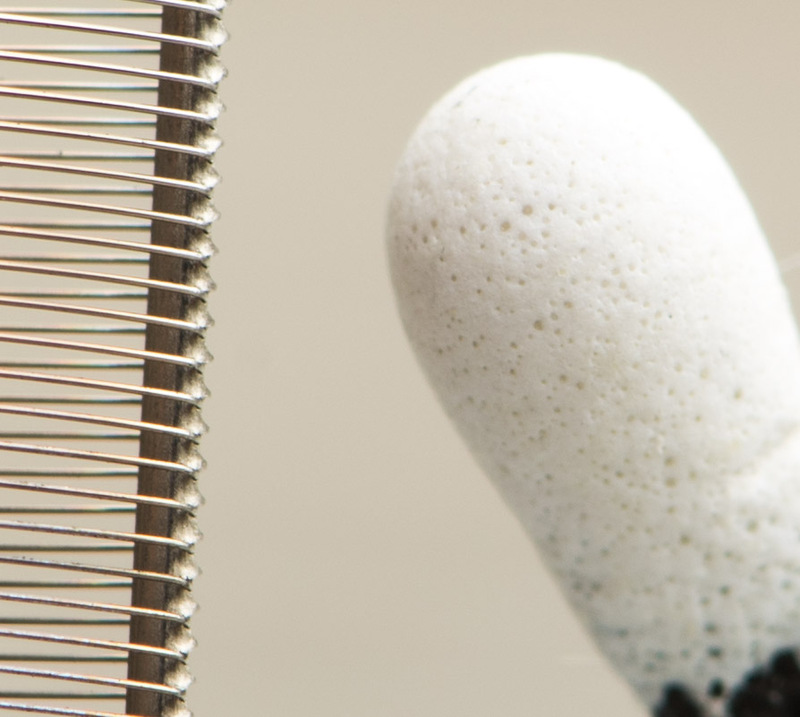 The Loktal tubes were primarily meant for use in mobile equipment like car radios. 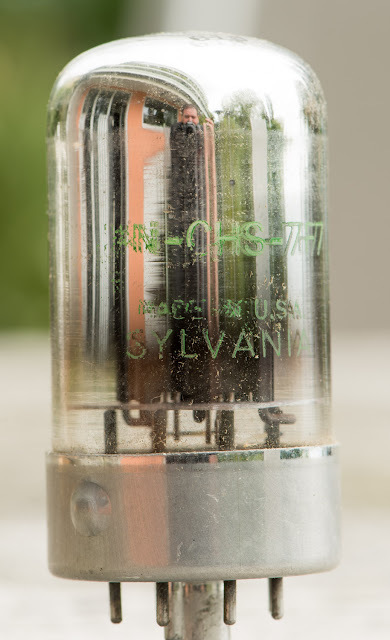 So Sylvania rated the heater voltage at 7V which is the nominal voltage of lead acid cells when being charged. 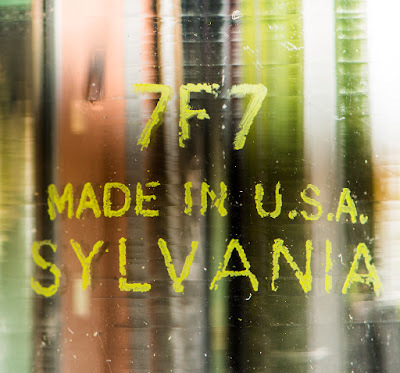 Just as nice as those of the 6SL7. Only a few manufacturers made Loktal base tubes. According to a reputable source they were only made by Sylvania, Raytheon and National Union. 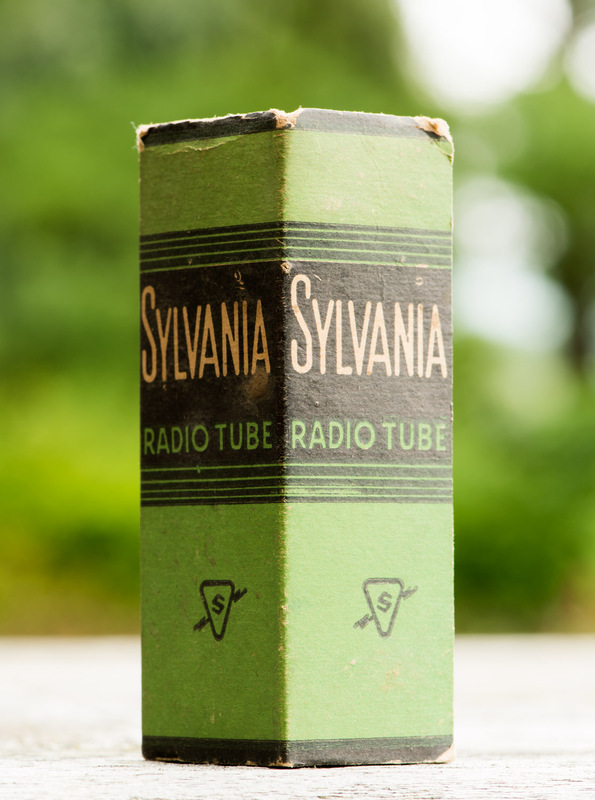 With the vast majority sold coming from Sylvania. 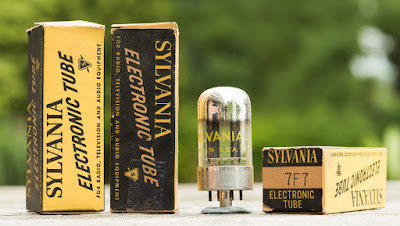 All other manufacturers who offered Loktals bought them from Sylvania and rebranded them. 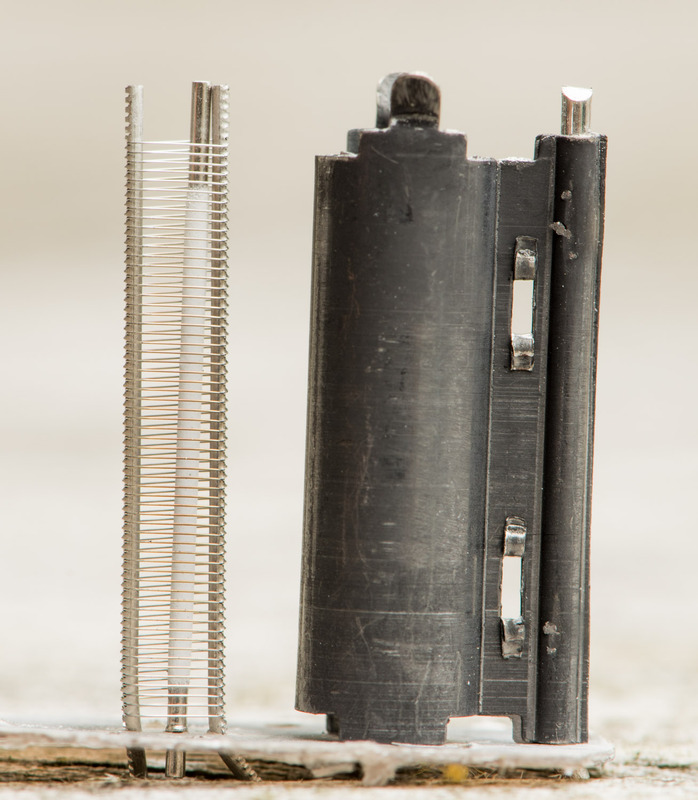 That's why you will only come across very few variants in construction style. 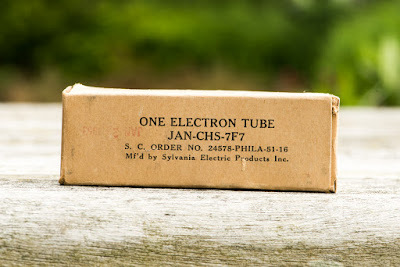 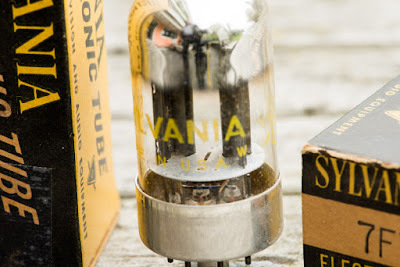 So let's start with photos of some Sylvania tubes. 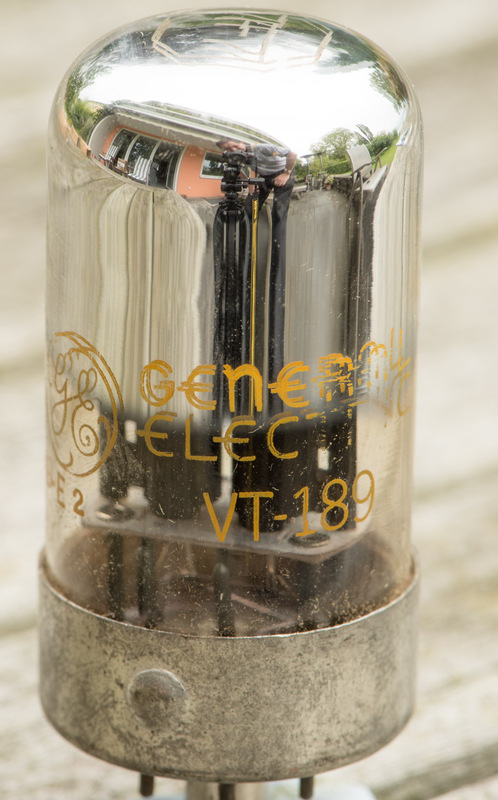 The oldest variant shown above. 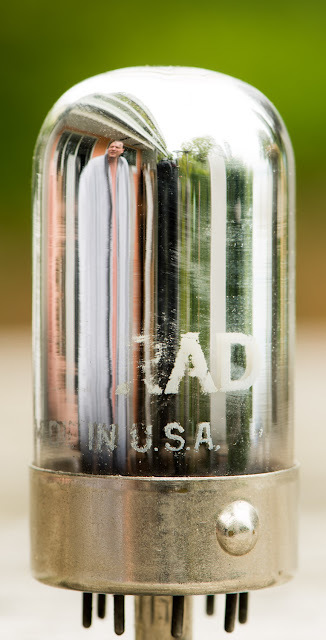 The next photo shows a later version, but it basically only differs in tube box and printing on the glass. 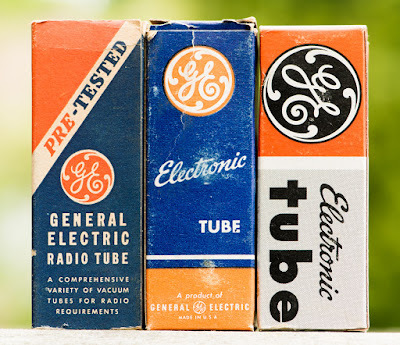 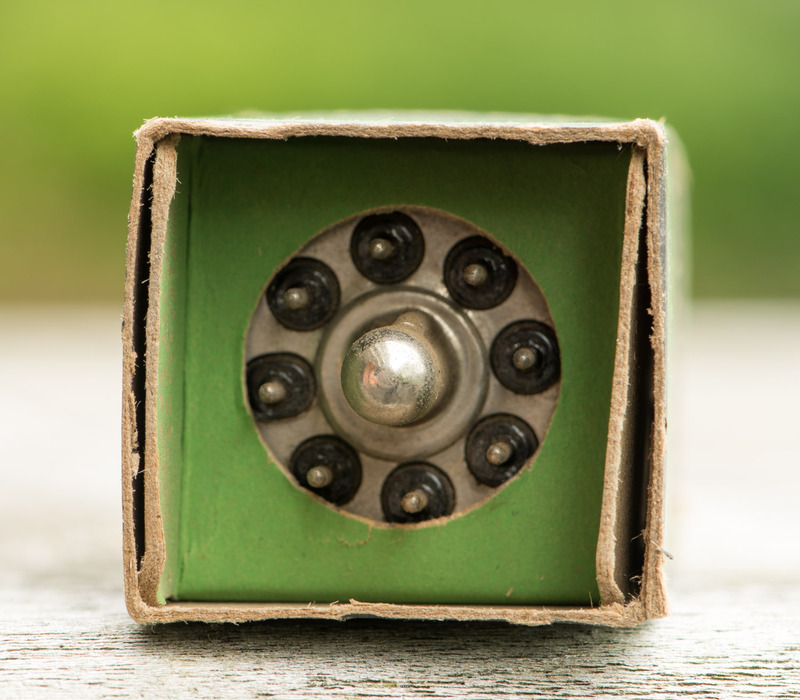 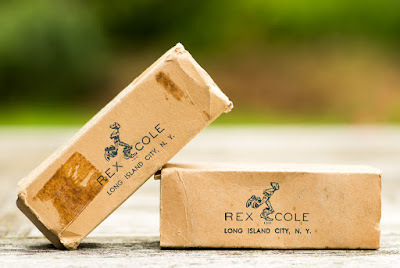 These boxes werde made such that the tube could be tested without removing it from the box. The top flap can be folded out. 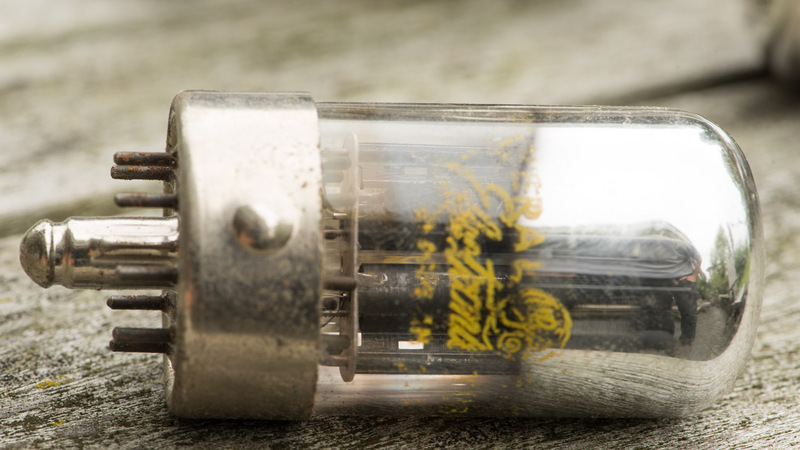 As can be seen in the next photo the correct spelling of the Loktals is with a 'K'. Often they are also named 'Loctal' with a 'C'. On the left the oldest one, which also collected quite some patina on the metal base, a common issue with Loktal tubes. 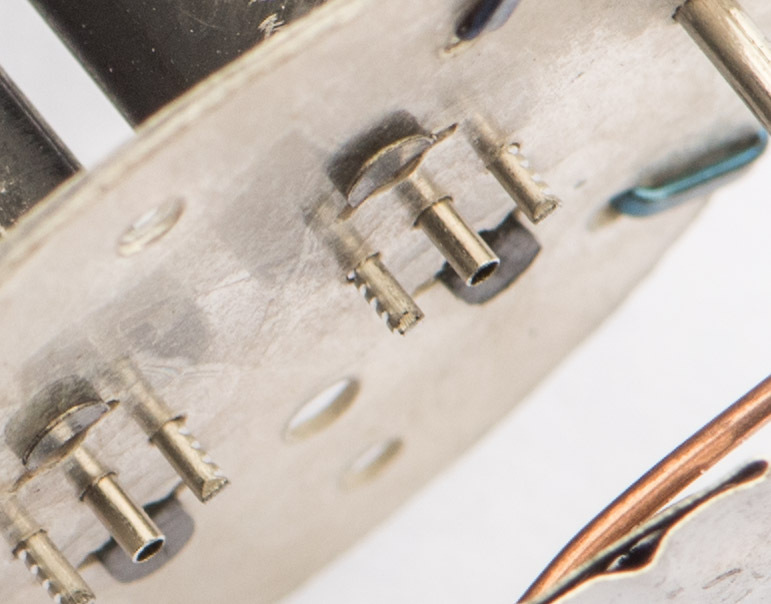 The later one has the same internal construction with nice round plates, closely spaced to each other. The amount of getter is a bit reduced. But inside the boxes I found a General Electric and a Sylvania. 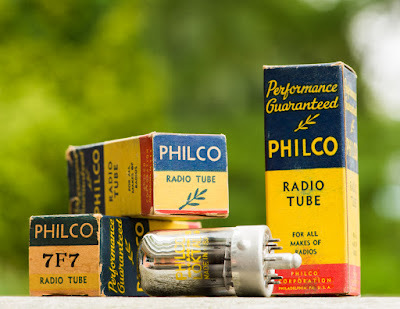 Not sure if they only had the packaging branded or if somebody simply put in old used tubes. 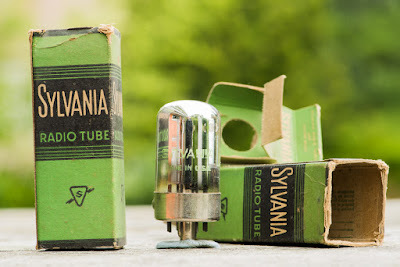 The Sylvania was obviously heavily used. 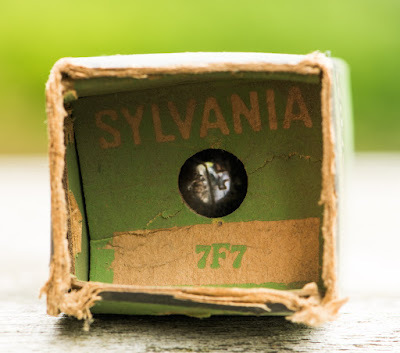 The National Union 7F7s in my stock also look very similar to the Sylvanias. Again opbiously from Sylvania as they share the same construction styles. For the tube of the month post of the 6SL7 I did not want to open up a pricey tube to show the internals. But the 7F7 is rather cheap and I will sacrifice one for dissection. 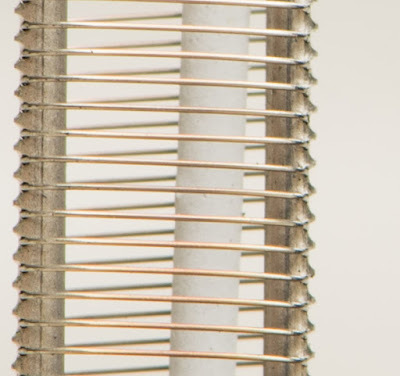 The grid wire appears to be gold pated! 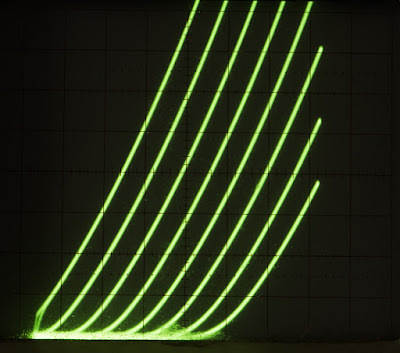 Grid in comparison to a match. 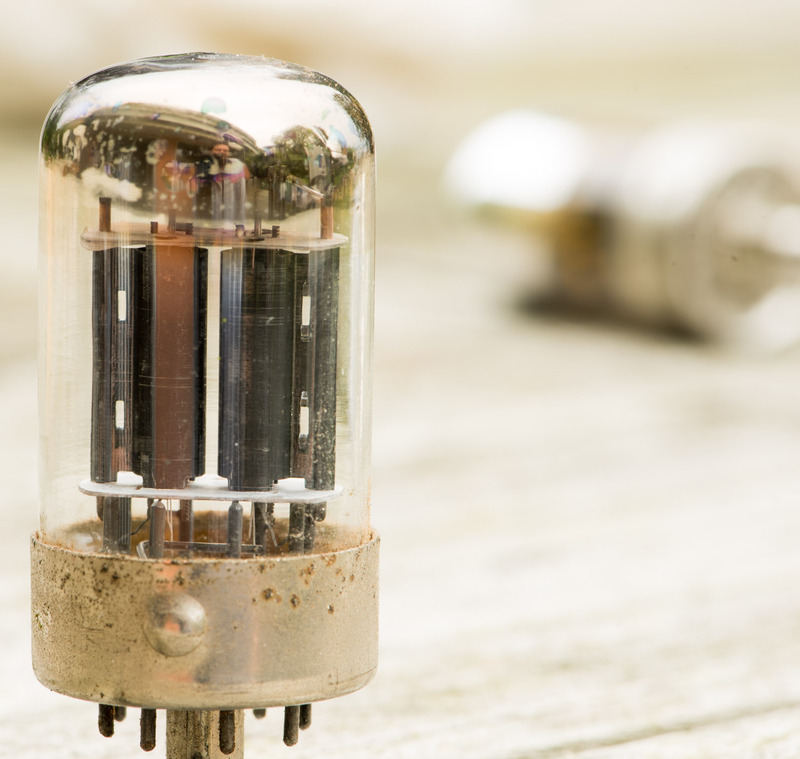 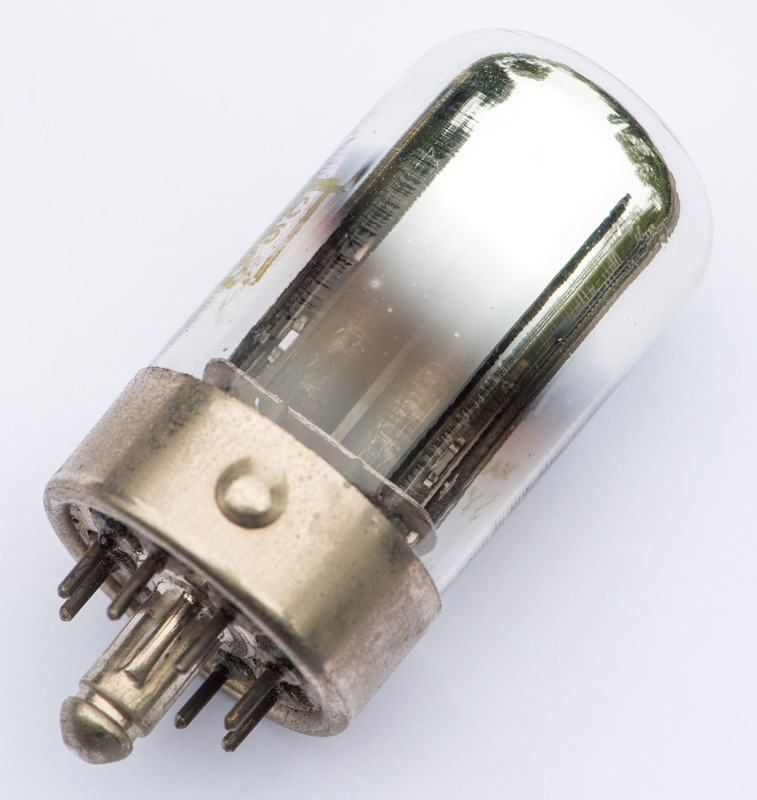 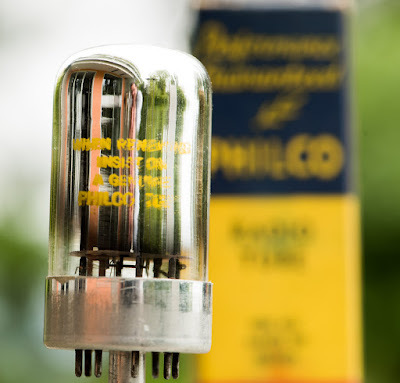 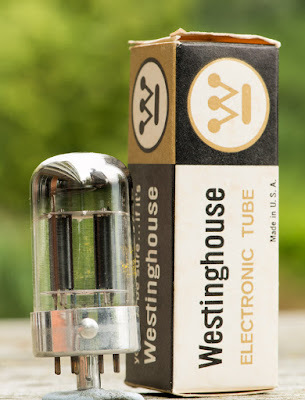 Another nice example of the marvellous vacuum tube engineering of the past.